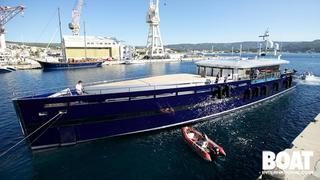 Following an eight-month period in Monaco Marine's yard in La Ciotat, where she underwent an amazing metamorphosis, the 44 metre motor yacht H20me was launched a few days ago under the name Blade. Within the gutting project, the new owner specified a lower-to-sundeck lift, a totally new interior by Michela Reverberi and three Sea Keeper Gyroscopic Stabiliser units. A real eye-popper will surely be the paint job, a combination of dark blue and a special chromium silver finish. Blade is available for charter through Fraser Yachts Monaco.